Konstruct Exhibitions launches Konstruct Economy Exhibition Stands - Affordable pre-designed exhibition stand packages for rental at prices well within your companies budget. 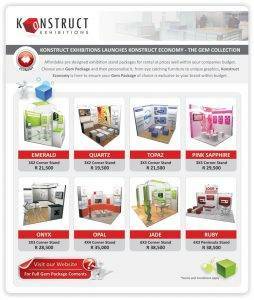 Konstruct Economy is here to ensure your gem package of choice is exclusive to your brand within your budget. Any of the above exhibition stands are available to enhance your brand and image at that important trade show you prepare for once a year, don't be average make an impact and get that coveted top of mind position all brands desire.